The N-SAT-110 telecommunications satellite, designed and built for Space Communications Corporation (SCC) and JSAT Corporation of Tokyo, Japan by Lockheed Martin Commercial Space Systems (LMCSS), was launched successfully on 06.10.2000 from Kourou, French Guiana. Lift-off occurred at 4:00 P.M Pacific Daylight Time (PDT) aboard an Ariane-42L H10-3 launch vehicle provided by Arianespace of Evry, France. Initial contact with the satellite, called acquisition of signal, was confirmed at 5:04 P.M. PDT from the Lockheed Martin satellite tracking station in Uralla, Australia. 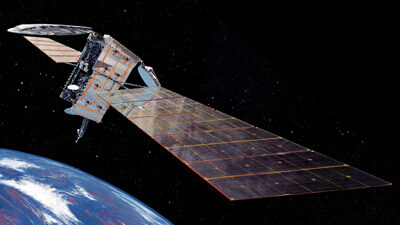 N-SAT-110 is a commercial telecommunications satellite program awarded to LMCSS in November 1998. Commercial Space Systems will provide the Lockheed Martin Series A2100AX satellite and ground station facilities, along with operational support for the first six months of the satellite's operations. The satellite carries 24 Ku-band transponders for various telecommunication applications including direct TV broadcasting and will operate at 110 degrees East longitude covering Japan and nearby regions. JSAT operates the satellite under thed designation JCSAT 110, while SCC uses the designators Superbird 5 (prelaunch) and Superbird D (on orbit).